Taliban Gunmen Storm School, Kill Dozens In Pakistan : The Two-Way Officials said at least 140 were killed, more than half of them students. The school is run by the military and the Taliban said they were retaliating for a recent military offensive. A Pakistani girl, who was injured in a Taliban attack on a school, is rushed to a hospital in Peshawar, Pakistan, on Tuesday. Taliban militants stormed a school in northwest Pakistan on Tuesday, leaving scores of students dead. Quoting Pakistani officials, multiple media outlets say the death toll is at least 140, including at least 80 students in grades 1 through 10. A little before 8 p.m. local time, police announced that the operation had ended after the gunmen were killed. Security personnel, police official Abdullah Khan told the AFP, were now in the process of sweeping the rest of the building. "It wasn't clear how many students and staff were still inside the facility. A student who escaped and a police official on the scene earlier said at one point about 200 students were being held hostage." The New York Times reports that Prime Minister Nawaz Sharif traveled to Peshawar. 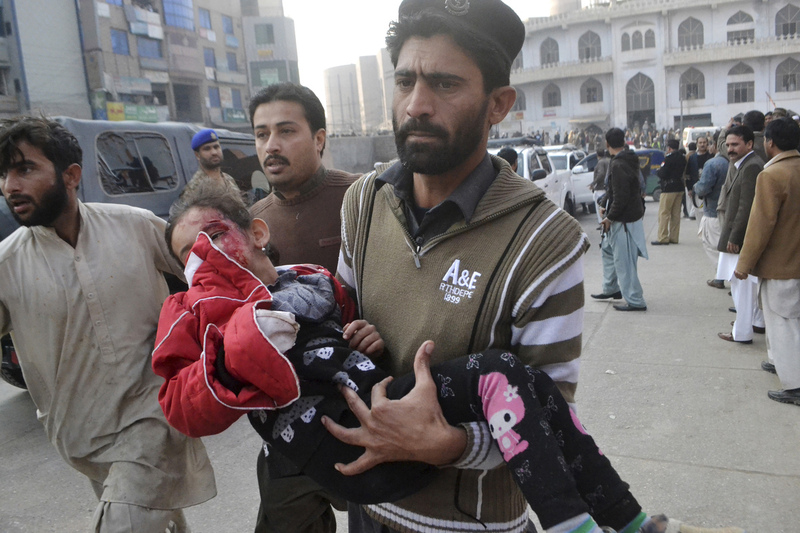 A spokesman for the Pakistani Taliban claimed responsibility for the attack. The spokesman tells The New York Times the Taliban said they were retaliating for a recent military offensive. Citing government officials, Dawn, the New York Times and the BBC are now putting the death toll at at least 140, most of them children. "The United States condemns in the strongest possible terms today's horrific attack on the Army Public School in Peshawar, Pakistan. Our hearts and prayers go out to the victims, their families, and loved ones. By targeting students and teachers in this heinous attack, terrorists have once again shown their depravity. We stand with the people of Pakistan, and reiterate the commitment of the United States to support the Government of Pakistan in its efforts to combat terrorism and extremism and to promote peace and stability in the region." The AP, Reuters, Dawn and the Express Tribune are reporting that the siege is over, after all six attackers were killed. The AFP quotes police official Abdullah Khan as saying "security personnel are carrying out clearance operation and hopefully they will clear the building in a while." "Witnesses described how gunmen went from classroom to classroom, shooting children, after a huge blast shook the Army Public School, while some described police struggling to hold back distraught parents trying to break past a cordon and get to the school when three loud explosions went off. "The ninth-grader said chaos ensued and the last thing he remembers is children and people falling to the ground. Kashan escaped but with injuries on his feet." Gen. Asim Bajwa, a Pakistani military spokesman, has been tweeting updates of the standoff. In his latest missive, Bajwa says that six terrorists have been killed, and children and teachers continue to be rescued. "IEDs planted by terrorists hamper speed of clearance," Bajwa says. Dawn newspaper reports that as Prime Minister Nawaz Sharif arrived in Peshawar, he said the country is now experiencing the blowback of its offensive against the Taliban and other militant groups in North Waziristan. "I feel that until and unless this country is cleansed from terrorism, this war and effort will not stop, no one should be doubtful of this. We have also spoken to Afghanistan about this and we will fight terrorism together," Sharif said. "Such attacks are expected in the wake of a war, and the country should not lose its strength."